The biggest field in sometime will contest this Saturday nights Queensland National 4s Title at the Shed Alliance Bundaberg Motorplex, with almost 30 entries for the Title. Defending Champion Tim Weir, who also won in 2014, and was the runner-up in 2016 and 2017, will be very hard to beat in his potent Sierra. Having won five feature races this season, Weir has also won at the venue, however, he is not expected to have it all his own way. Despite just the one Feature Race victory for the season, last years runner-up Matt Bielby is also expected to be hard to beat, showing great pace, while Darren Brumpton, Darryl Oliver, Ben Stead and Matthew Claydon have all tasted Feature Race success this season, and are expected to figure throughout the night. 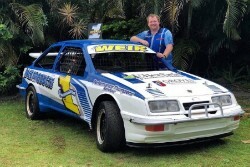 Add to that list 2015 State Champion, Rodney Midolo, Hayden Turner, Bevan Burton, Dennis Shallcross and Bevan Burton, a highly competitive night of racing is assured.